● To avoid damage and loss of function when using a USB device, note the following precautions. 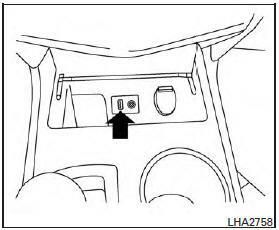 The USB input jack is located on the center console beneath the heater and air conditioner controls. Insert the USB device into the jack. Information about the audio files being played is shown on the display screen of the vehicle’s audio system. Touch “Browse” to display the list of folders and files on the USB device. Touch the name of a song on the screen to begin playing that song. times to skip backward several tracks.